A data processing set designed exclusively for processing measurement data. *A wealth of 2.5-dimensional data processing functionality, accumulated and perfected via the DP Series 2-dimensional data processing and NEXIV CNC video measuring systems. *Equipped with convenient functions, starting with Navigation, for exclusive use in doing manual measurements. *Offline teaching, report generating and other optional software can be used. *Can also be installed in a notebook personal computer. *Allows chart measurements in the video window using chart generation software (optional). Equipped with image processing functionality, this package allows high-precision image measurement with a manual measuring instrument. 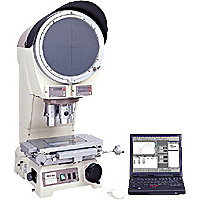 * Can be added to a measuring microscope. * Allows chart measurements in the video window using chart generation software (optional). * A wealth of 2.5-dimensional data processing functionality, accumulated and perfected via the DP Series 2-dimensional data processing and NEXIV CNC video measuring systems.